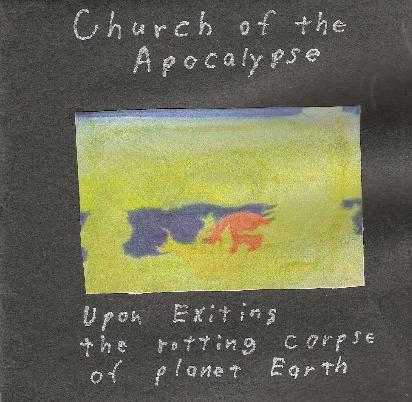 Church of the Apocalypse - "Upon Exiting the Rotting Corpse of Planet Earth"
Primitive electronics and proto-industrialism ala Throbbing Gristle, Psychic T.V. and SPK. Devoid of any tonal center or melodic counterpoint, the six tracks on Upon Exiting the Rotten Corpse of Planet Earth are disturbing mélanges of electronic noise that remind one of a continuous soundtrack to the positronic nightmare of a psychotic robot. The colorful SF titles ("Orgone Crash Landing," Cryogenic Distress Resonance," "Waves of Dark Matter") relate a fractured narrative of a dying earth being left behind for new vistas in the boundless void of space, but the music itself is relentlessly harsh and edgy. Shrieking circuitry, twisted metal and steel sounds and deranged synthetic rhythms create a forbidding landscape of horrific dimensions. Stretched over an hour, the clanking of machinery and the grinding of gears can become both monotonous and wearisome. But there are moments where Church of the Apocalypse achieves a kind of robotic catharsis that somehow transcends its limitations. Like all primal music-blues and punk, for instance-the "songs" on Upon Exiting the Rotting Corpse of Planet Earth are meant more to be felt (if only as pulsations of energy) rather than heard as music. Imagine The Stooges tweaking audio generators and sampling sounds from the music library of an alien race and you've got a pretty fair idea of the sonic terrain explored by Church of the Apocalypse. For more information you can visit Church of the Apocalypse at http://www.soundclick.com/churchoftheapocalypse or http://www.audiostreet.net/churchoftheapocalypse.